About: A well established brand located in the Heart of Londons West End. With Yates you get a family friendly pub/restaurant in the day times, which then turns into a vibrant party venue from 8pm onwards. You can book tables and pre-order drinks packages for any occasion to experience the nightlife here to the maximum! Went here with my friends on friday night and we have vowed never to go back. Got groped on the dancefloor (which resembled a meat market), the cloakroom is miles away from the front door and its too hot. went to yates ona saturday night-good up-to-date music, very hot though and not much talent for the girls! !plus had my mobile stolen-so if you're gonna go keep everything close! 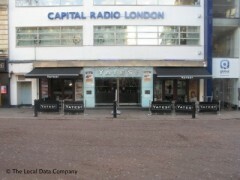 Went into Yates Leicester Square on friday night. It was full of the kind of unsavoury types you'd expect in such a place, won't be going again.